Movies, music, stars — and oh yeah, SLIME! Anything can happen at the 2019 Nickelodeon Kids' Choice Awards - and you could be there for every unexpected moment—and a whole lotta Slime! 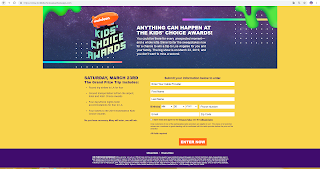 Enter now at https://www.nickkidschoiceawardssweeps.com for a chance for you and your family to win a trip for four to Los Angeles to experience the biggest night in kid culture: the 2019 Nickelodeon Kids’ Choice Awards! The show is all about everything you and your kids love: the biggest blockbusters, the hottest chart-toppers, and of course, everyone's favorite celebs getting slimed! The big show is on Saturday, March 23, 2019, and you don't want to miss a second! 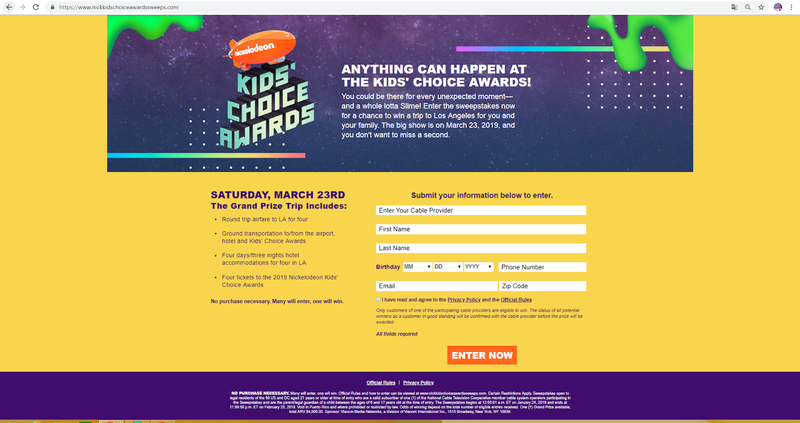 Enter the 2019 Nickelodeon Kids’ Choice Awards Sweepstakes for a chance to win a trip to Los Angeles for you and your family! Enter the contest everyday at https://www.nickkidschoiceawardssweeps.com! Good luck! Don't miss the Nickelodeon Kids’ Choice Awards 2019, being held LIVE on Saturday, March 23 on Nick USA! It's going to be out of this world! Limit one (1) entry per calendar day per person/household/email address. A “calendar day” is defined as the 24 hours between 12:00:00 a.m. ET and the following 11:59:59 p.m. ET. Only customers of one of the participating cable providers are eligible to win. The status of all potential winners as a customer in good standing will be confirmed with the cable provider before the prize will be awarded. the postmark. Mail-in entries must be postmarked no later than February 20, 2019, and they must be received by February 25, 2019. Official Rules and how to enter can be viewed at www.nickkidschoiceawardssweeps.com. Sweepstakes open to legal residents of the 50 US and DC aged 21 years or older at time of entry who are a valid subscriber of one (1) of the National Cable Television Cooperative member cable system operators participating in the Sweepstakes and are the parent/legal guardian of a child between the ages of 6 and 17 years old at the time of entry. The Sweepstakes begun at 12:00:01 a.m. ET on Thursday, January 24, 2019 and ends at 11:59:59 p.m. ET on Monday, February 25, 2019. Void in Puerto Rico and where prohibited or restricted by law. One (1) Grand Prize available, total ARV $4,000.00.